WCF services in enterprises are used for developing distributed enterprise application. There are lots of advantages of using WCF services. WCF service can be exposed on multiple endpoints e.g. HTTP, TCP etc. and the client applications have a choice to select the specific endpoint for the communication. WCF 3.5 had introduced support for Representational State Transfer (REST) using which the response from the service can be directly send using Plain Old Xml form (POX). If the WCF service is using REST/POX, then it is not necessary for the client to consume the WCF service proxy. For REST, WCF introduced a new binding i.e. WebHttpBinding. 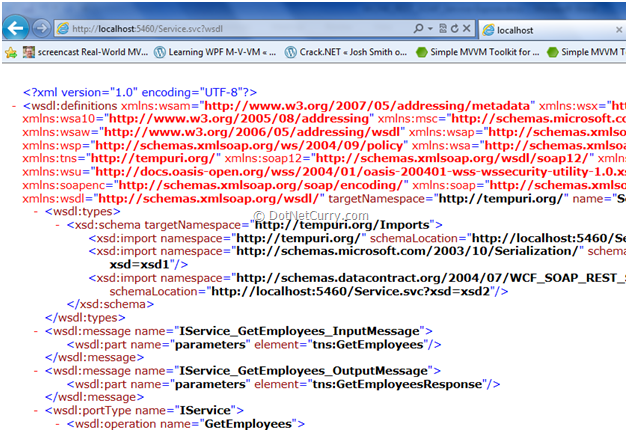 A client application that can do HTTP communication and can process XML, could now directly make a call to the WCF service and perform operations using XML. And now the million dollar question which motivated me to write this article – If an existing service is already exposing SOAP using bindings like the basicHttpBinding, then can the same service expose REST i.e. using WebHttpBinding too? The answer is YES and in this article, I have explained the same. Step 1: Open VS2010 and create a Blank solution, name it as ‘WCF_SOAP_REST’. 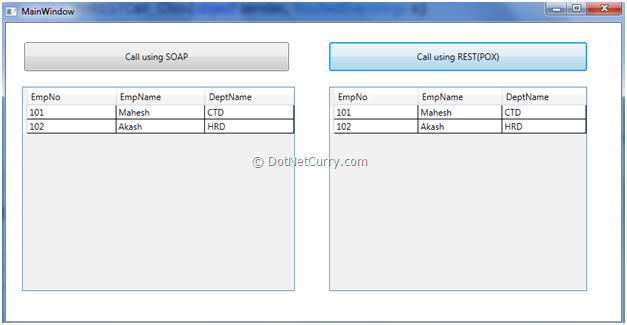 In this solution, add a new WCF service application and call it ‘WCF_SOAP_REST_Service’. Make sure that .NET 4.0 framework is selected. 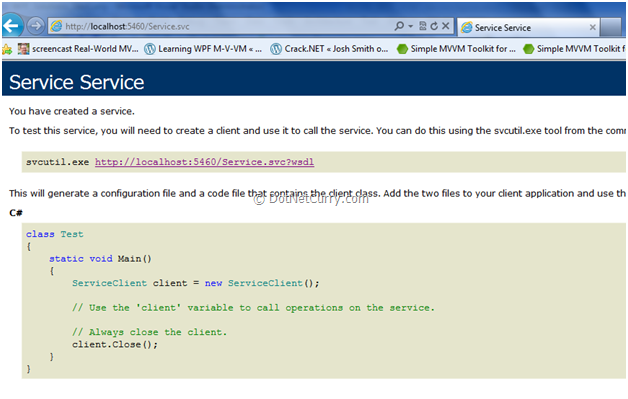 Step 2: Rename IService1.cs to IService.cs and rename Service1.svc to Service.svc . Add the following ServiceContract, OperationContract and DataContract in IService.cs. 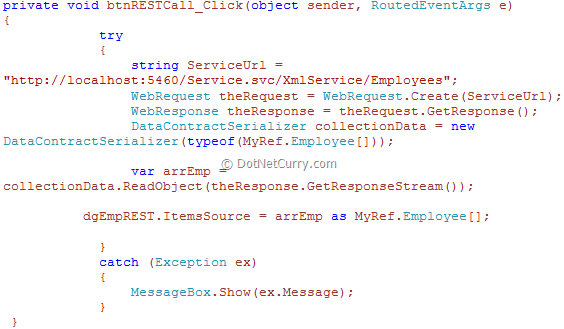 The OperationContract GetEmployees() also applied with WebGet attribute for REST exposure. Step 3: Open the Web.Config file and define two endpoints – one each for SOAP and REST. The binding for SOAP is basicHttpBinding and for REST is webHttpBinding. Also define ServiceBehavior for publishing metadata for SOAP endpoint so that the client application can consume the WCF service. Define EndpointBehavior for the REST endpoint so that the XML response can be send and the help page is displayed to the end user. 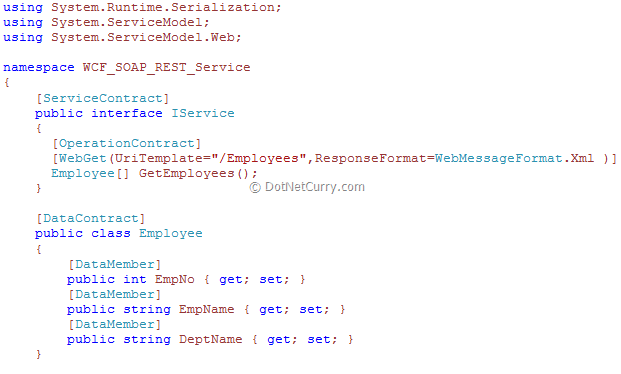 The attribute AspNetCompabilityRequirements is used for specifying an ASP.NET compatible environment for WCF service execution. We have successfully exposed the WCF service both on SOAP and REST. 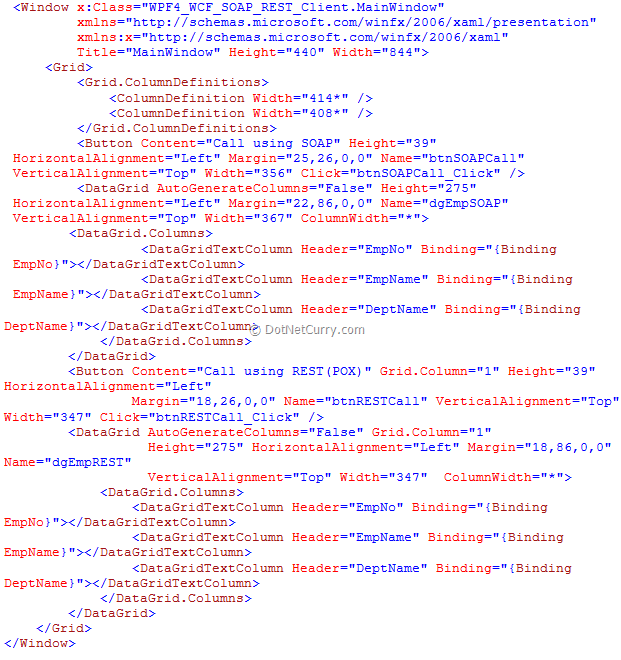 The above xaml declares two buttons and DataGrids, each for the SOAP and REST call. 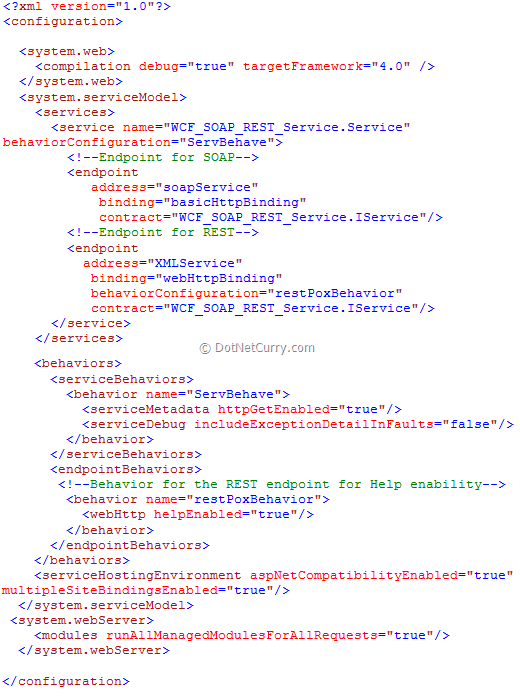 The above code creates a WebRequest using the WCF Service Url with REST endpoint name. The response is collected using WebResponse class. Since the response is containing a stream of objects using DataContractSerializer, the response message stream is deserialized and the result is stored in an Employee.